She is the whisper on the playground. She is the thing that the Things in the dark are afraid… until now. 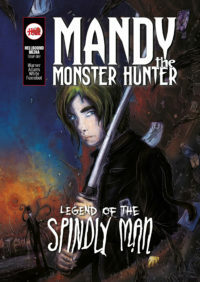 Mandy the Monster Hunter returns in the first part of a haunting new mini series which sees her face the terrifying force of The Spindly Man. As children disappear, Mandy investigates an entity that scares away even the other monsters that lurk in the closet. What is the Spindly Man and can she defeat him?